Pack: lie flat comb bound A4 book, instructions DVD and CD of dance music. 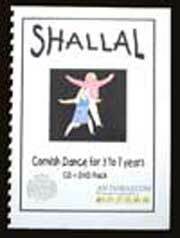 Shallal' meaning a "…band of musicians with kettles, pans and tea trays" is a pack created specifically for 'Early Years' teaching, those children aged between 3 and 7 (Key Stage 1), giving an ideal introduction to the ideas behind traditional Cornish dance. The pack contains a DVD, CD and dance notation booklet with a very simple warm up exercise for both children and teachers to follow. The music is fun and rhythmic aimed specially for this age group of children, and the dances have been hand picked and altered slightly making them free from unnecessary details and hassle. This pack allows for a truly enjoyable first experience of Cornish dance. A must have for primary school teachers. This pack was created to provide dances for an adult dance workshop giving a chance to see the range and variety of Cornish dance. i.e. step dance, troyl dance, furry dance. A CD is provided at about normal dance pace. We hope it provides the same enjoyment to other groups as it did to the international dance class at Cecil Sharp House in 2005, who were the original guinea pigs ! Pack : comb bound lie flat A4 book/Music CD / instructional DVD plus DVD or archival footage. 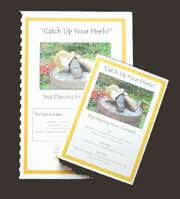 This dance pack has been designed primarily as a teaching guide for Cornish step dancing. The DVDs and CD, in conjunction with the dance instructions and music manuscript, should give you the basis to either start Cornish step dancing yourself, or to aid you in teaching it to others. The booklet contains newly published research into the dances, and archive visual and audio material which has not previously been widely available. Includes dance notation and music for 45 dances. Paperback with 17 black and white photographs. A history of dancce in Cornwall from the earliest referenes in Cornish literature to the dances of the folk revival. Collected by members of teh Davey family, noted musicians. 45 dances are clearly transcribed - social dances, broom dances, snail creep,guise and furry dances - accompanied by tunes traditional and modern, for use in schools, festivals, workshops an country dances.